Free bicycle transportation from Ticino to the station of your choice. 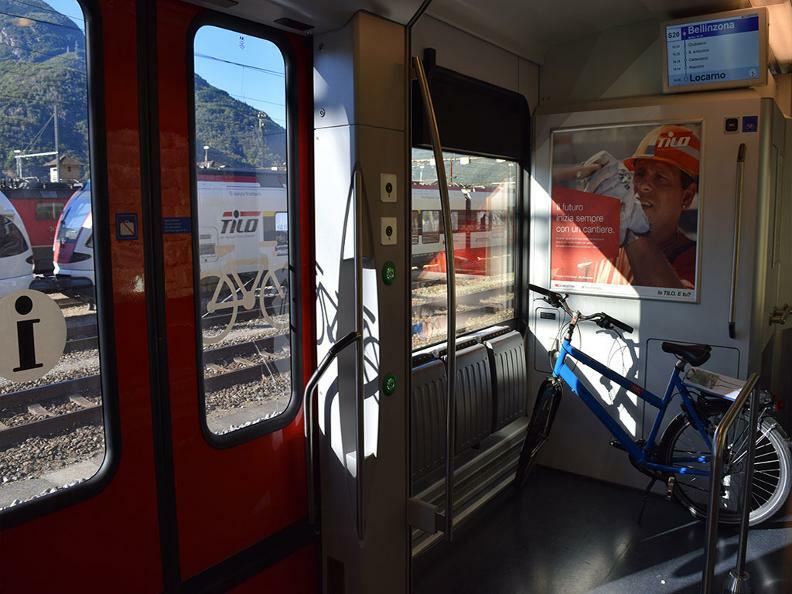 Between 12 April and 31 October 2019, you can submit your bike free of charge from Bellinzona, Chiasso, Locarno, Lugano and Mendrisio stations. SBB transports your bike safely to a station that takes receipt of bikes. This means there is no need to look for a bike compartment or pay for self-service bike reservation when travelling through the Gotthard Base Tunnel. You will find further information at sbb.ch/en/bicycle-shipping. Travelling by train with a bike is possible, with three different options: loading your bike by yourself, taking your bike as hand baggage or shipping your bike. You can load your bike onto most transport connections yourself subject to purchasing a valid bike ticket. Connections: in order to find the connections that allow you to load your bike yourself, simply do an advanced search on the SBB online timetable and tick “Carriage of bicycles required (Switzerland only)” in the “Connections” section. Price: a day ticket with a half-fare travelcard costs CHF 13.-, full price CHF 20.-. Bikes belonging to children under 6 years old can be transported free of charge. Reservations: they are compulsory during the summer season on trains travelling through the Gotthard Base Tunnel. Reservations cost CHF 5.- and purchases can be made at the station or via the SBB app or SBB.ch website up to 5 minutes before the train departs. Availability: bike places may be limited. Your bike can be delivered to the station and shipped as baggage. With a valid ticket, you can ship and collect your bike at most stations with a baggage office. If delivered to the baggage office before 19.00, you can collect your bike two days later from 9.00 onwards. Bikes can be placed in a bag and transported as hand baggage. The front wheel must be removed and placed in the carry bag together with the bike. It is free to transport bikes as hand baggage.